Schedule Your Holiday Workshop Today! I'm participating in a Book-A-Thon with Stampin' Up through the end of day tomorrow, November 5th, 2013. If I am able to book three or more parties by tomorrow night, I will win a prize and I'd like to share that fun with you! Email me directly or use the "Contact Carrie" form on the left to let me know you'd like to book a party by 9:00pm on Tuesday and I'll give you a grab bag of goodies valued at $25 at your party!!! I'm happy to customize the event to meet the interests of you and your friends. There are lots of fun projects we can do to prep for the holidays, including Holiday Cards, Gift-Card Holders, Cute & Easy Packaging, etc. Hurry, the clock is ticking! 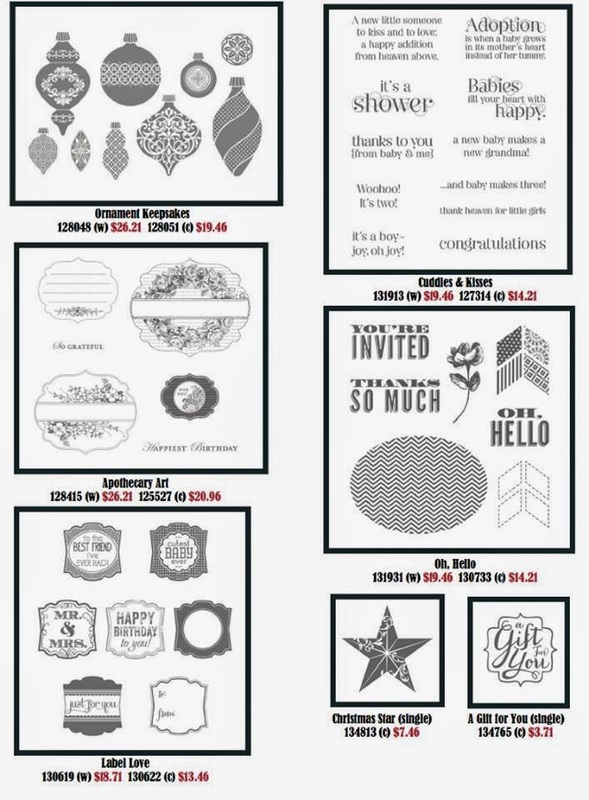 Celebrate Stampin' Up! 's 25th Anniversary with a Sale on Stamps! 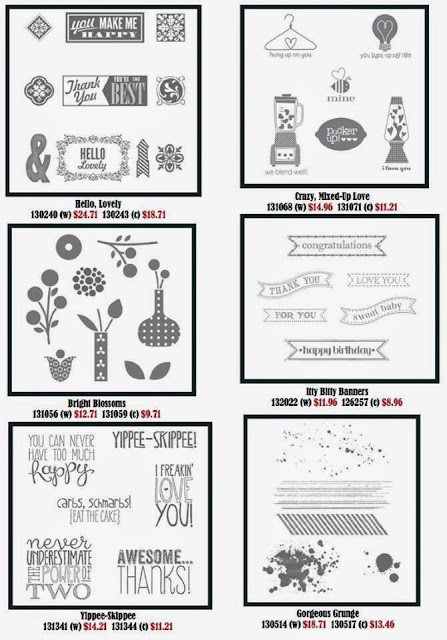 Through Monday, October 28th, enjoy 25% off of 25 great stamp sets! Order them in my online store and enjoy 25% off through tomorrow night. I decided to jump into the world of video tutorials! It took me awhile to figure out the setup and how get started, but it's actually not too bad! I was definitely nervous while making this, which felt a little odd as I usually don't get too much stage fright. I guess it's just going to take some practice. As this is my first video, and most of my customers are fairly new stampers, I decided to go back to the way back and show how to make basic card bases. In the 2013-2014 annual catalog, Stampin' Up! offers the Stampin' Write Marker New Color Kit (item 130034, page 163) to help you update your Stampin' Write Markers Collection. For a limited time, from June 26 until October 31, you can buy any of the new colors as a pack or individually! 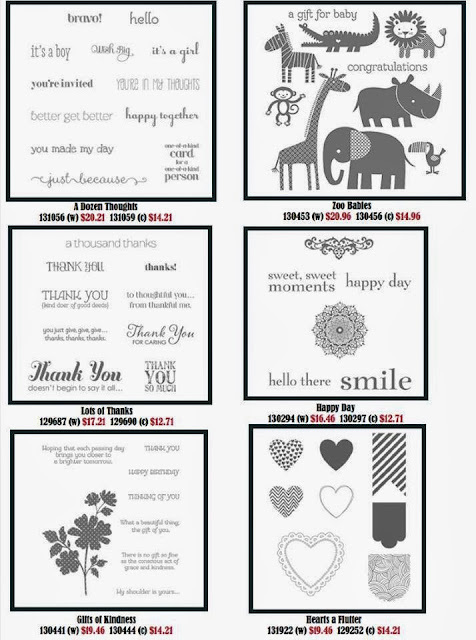 Go ahead, fill in the missing pieces in your collection or buy the whole Stampin' Write Marker New Color Kit! I love the simplicity and clean lines of this card. I enjoy making a card with simple components that comes together looking a little fancier than it really is. I gathered the inspiration for my color palette from a now-retired line of Designer Series Paper, More Amore. 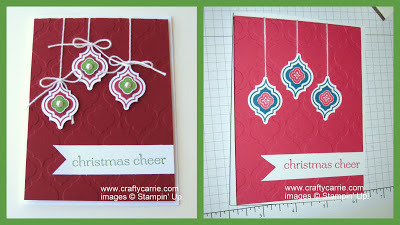 This is a favorite starting place for me in card design - it's so easy to create a polished look with Stampin' Up! as all the materials color-coordinate. Cut a piece of DSP (on sale now!). to 2" x 4.25"
Choose two coordinating colors (I used Primrose Petals and Pool Party) from your DSP and one coordinating neutral (I used Very Vanilla). Feel free to mix-up your sentiment. My "Happy Mother's Day" greeting is from the Teeny Tiny Wishes stamp set that I use all the time for many occasions. It has just about everything you need in it! I stamped my banner on a scrap piece of very vanilla that measures 1/2" by 2 1/2". Don't forget to finish off your flower with an adorable embellishment! Here I punched a tiny flower from our Itty Bitty Shapes Punch Pack and adorned it with a Basic Pearl. 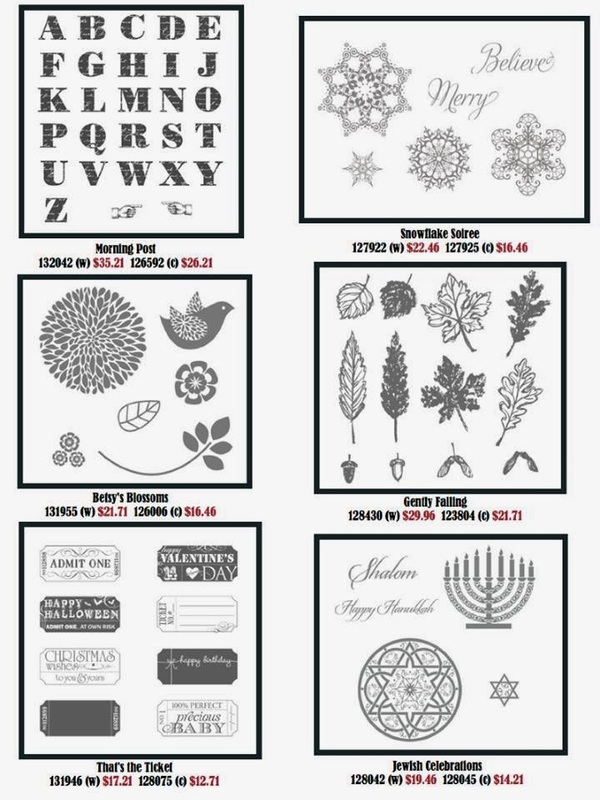 Now through August 31, you can try out the fun new Paper Pumpkin kits from Stampin' Up for 1/2 price! That's two months at $10, including shipping! It's a steal of a deal and a super-cute (and easy) way to bring more crafting into your life. 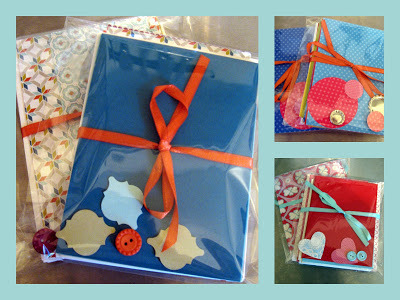 Each month, you will receive an adorable red box filled with everything you need to create a quick and cute project. The kit's contents are a surprise each month, but your first kit comes with a free gift - a clear block that you can use with the stamps in all your future kits! If you're curious about Paper Pumpkin, this is the perfect time to try it as you get two months for the price of one. Join Now! Offer Details: Use the promotion code PUMPKINDEAL to join Paper Pumpkin before August 31, 2013, and pay only $10 a month* for the first two months. Stamp the same flower again on a scrap piece of Whisper White cardstock in red and again in Gumball Green. Punch out both flowers using the Blossom punch. Snip off two of the Gumball Green petals for the "leaves." Stamp the larger circle image on Whisper White and punch out using the 1" Circle Punch. Assemble your flower layers using a coordinating brad. 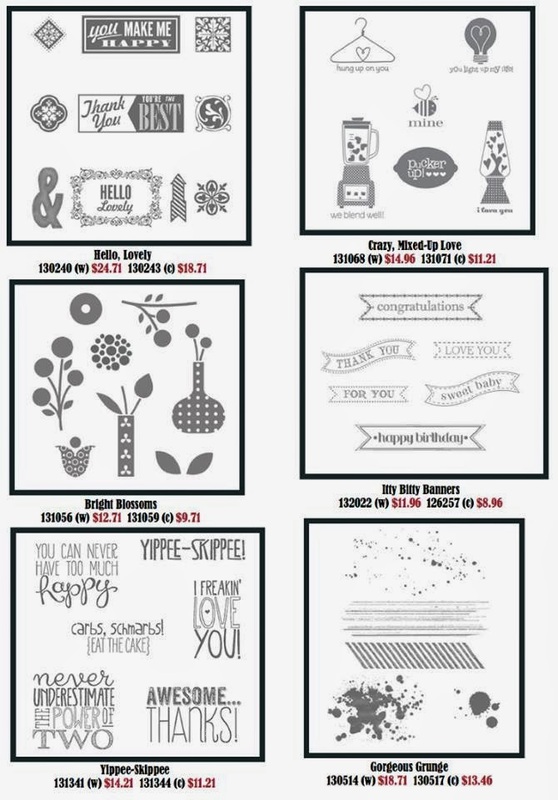 Through August 31, join Stampin' Up and receive a super-cute free project kit! This is in addition to the $125 in product you receive for only $99 (plus FREE shipping!). Depending on what kit you choose, that's up to $154.90 in wonderful paper-crafting goodness for $99. If you have a growing wish list, this is a great time to sign up and enjoy the savings. If you'd like to turn Stampin' Up into a part-time business, that's awesome. If you'd like to be a Hobby Demonstrator and receive 20% off all your orders, that's also awesome. Contact me for more info or click here to join! #1-3 are all in the brand new Holiday Catalog - please let me know if you do not yet have a copy and I'll send you one right away. #4 is located on pages 158-159 of the 2013-2014 Idea Book & Catalog. Here's what the Tag a Bag and Tag a Box bundles look like, so cute!! Now through July 31, buy 3 packs of select Designer Series Paper, get one free! That's a savings of $10.95! Lightly sand the Core'dinations cardstock to bring out the lighter color. 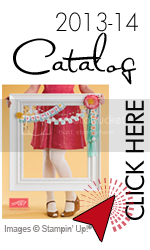 Use a glue dot to adhere the little knot of ribbon. I love this stamp set! It's one of the very first sets I purchased and I have used it a bunch. (Pun intended). It's great for creating focal points as well as backgrounds and it coordinates perfectly with the Blossom Punch, making is super easy to cut out the flower shape. I'll be featuring some samples made with this set over the coming days, so stay tuned! Each layer is 1/4" smaller than the last which means that Real Red is cut to 4"x 5.25" and Whisper White is cut to 3.75" x 5"
Easily mix up the message with any one of the great sentiments in Teeny Tiny Wishes. This card would be great for birthdays and thank-you cards too. New! Follow me on Facebook! I am morning the loss this week of my tried and true blog reader from Google. Why Google decided to do away with my favorite procrastination tool way to stay informed of important crafting trends, I may never know. After a very quick Google search, it looks like most of the blogosphere is switching to Feedly.com to track their blogs and stay on top of all the amazingness on the web. I have added a button the right-hand side of my page for you to subscribe to my blog using Feedly. Let me know if you've found another blog reader you prefer and I'll investigate adding a button for it as well. I'm pretty sure there is no better way to spend a Sunday afternoon than hanging out with girlfriends and creating together. I've done a lot of crafts over the years, but one of the things I love the most about card-making is how (relatively) quickly you can make something cute to brighten someone's day. I'd love for you to come craft with me! See my upcoming classes page or host your own private class and earn free products! Contact me for more info. Well, I goofed and posted my excitement about being a new auntie on my Facebook page today before my sister had spread the news outside of our immediate family. My enthusiasm is understandable but it really should have been my sister's news to share. So while the cat's out of the bag on that bit of news, I won't share the gender just yet until I have full permission. 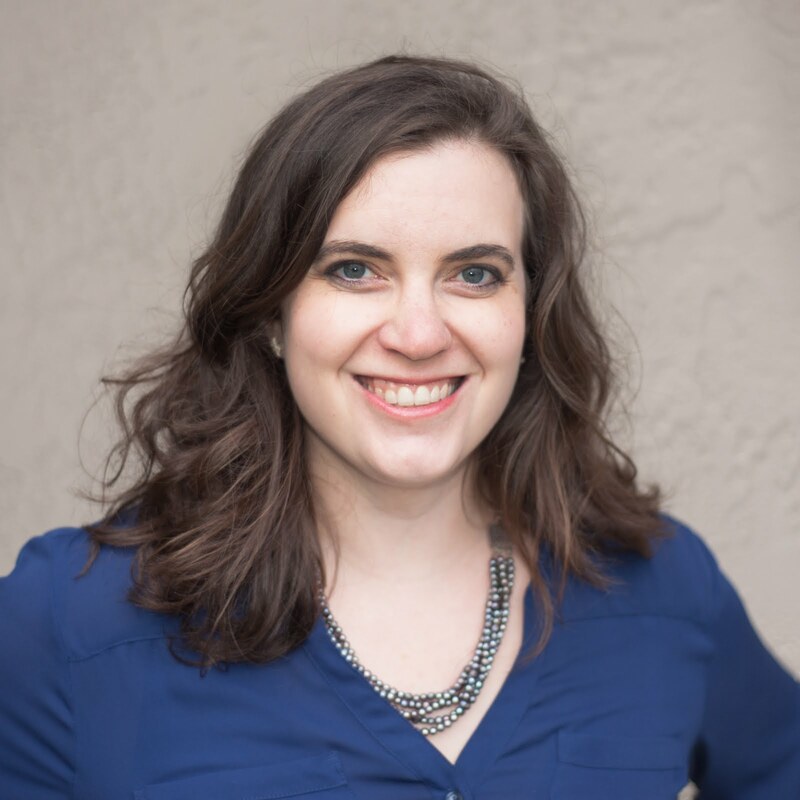 Let me tell you though, I'm a wee bit excited about this auntie business, and it's hard not to shout the good news from the rooftop! For her baby shower last month, I wanted to make some cute, yet modern invitations. I CASE'd this design from Dawn Olchefske and added my own twist. I think they turned out super-cute! Here's my Stampin' Recipe, feel free to contact me if you have any questions! I spent some time this weekend assembling the free card kits for my New Catalog Party next Sunday and I think they turned out super cute! Each kit contains more than enough coordinating Designer Series Paper, coordinating cardstock and envelopes to make six cards. And because I was having so much fun, I threw in a couple of coordinating accessories and embellishments to make some super-cute projects! Would you like a free card kit of your own?? All you have to do is RSVP by Monday, June 24 and attend my New Catalog Party on Sunday, June 30. Click here to RSVP so I can make sure to have enough kits! Over the next ten posts, I'll be revealing the items I'm most excited about in the new catalog. It's not easy to whittle the list down to ten! #10 - Timeless Talk Stamp Set -- I love the old-timey charm of this stamp set. I adore the sample set of note-cards made with this set shown on page 18 of the new catalog! I cannot wait to get my hands on this set and make up a bunch of sweet cards to have on hand. Sunday, June 30 2013, 1:00pm-3:30pm -- New Catalog Party!! FREE! For every guest that RSVPs and comes to my open house, I will be giving you a *free* card kit! Plus, for every $50 you spend, you can pick out an additional free card kit! FREE! Every guest will receive a copy of the new new Idea Book & Catalog full of amazing project ideas and inspirations as well as tons of exciting new products! FREE MAKE & TAKE PROJECT! 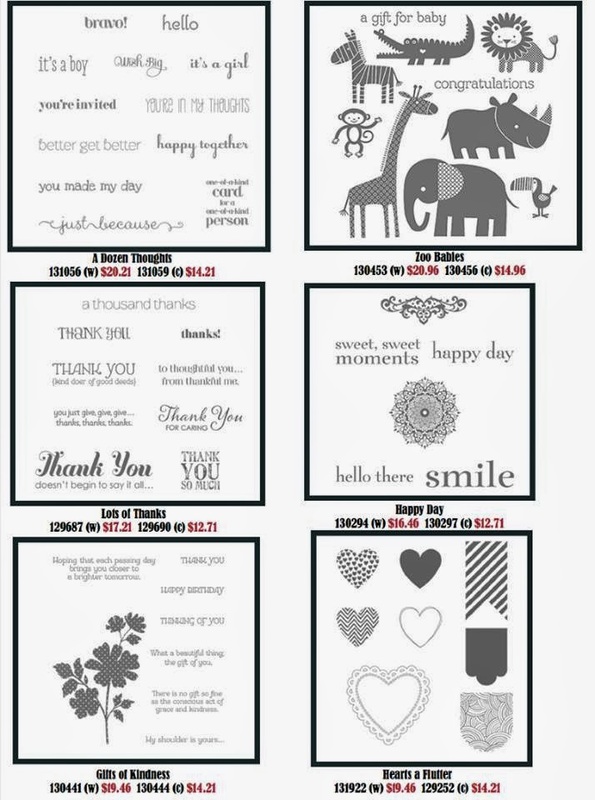 I'll have a super cute project for all guests to make using some of the awesome new products from the catalog. The party will be held at my house in San Leandro unless I get an overwhelming response in which case I will find a larger space to hold the party. I will send you my address after you register. I'm so excited to have set up a place to share my paper-crafting excitement!! Paper crafts have pretty much taken over both my spare time and any available surface in my cottage. It's alright, I'd rather be surrounded by creativity than devoid of it. Here's a sneak peak at what we'll be making!